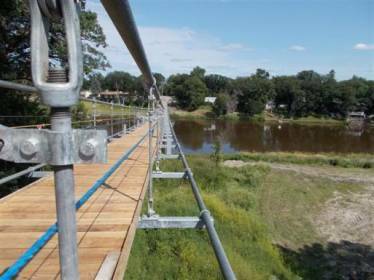 In early spring of 2011, flood waters surged through the Souris River, located in the Canadian Province of Manitoba, severely damaging Canada’s longest pedestrian suspension bridge. Shortly after the bridge was destroyed, The Town of Souris teamed up with an engineering firm to begin work designing a replacement bridge. Portland Bolt was contacted in January of 2013 to provide the 150 tie rod assemblies and round bend U-bolts which would fasten the suspension bridge together. Portland Bolt was able to manufacture these nonstandard bolts quickly by taking advantage of our steel inventory of over one million pounds and our in-house hot-dip galvanizing line. Since Portland Bolt was able to keep all of the manufacturing operations in our facility, we were able to control the lead time and keep the project on track. 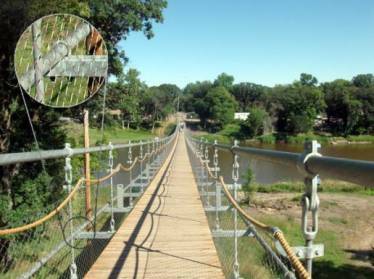 The new swinging suspension bridge opened to the public in Souris on August 17th, 2013. 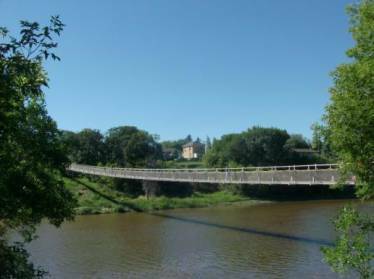 The bridge spans over 600 feet in length (184 meters) and puts Souris back on the map as having the longest pedestrian suspension bridge in Canada.